What content should be included on my homepage? First time website visitors will not be convinced to buy from your company if they do not trust your brand, so make sure your first impression is a good one. Since your homepage is generally where new visitors generate their first impression of your company, it is especially important to provide sources of validation here to encourage trust. Add credibility by showcasing past client lists, portfolios, and respected online payment methods (if applicable). To minimize the clutter, simply provide links to these sources or display only a few highlights on your homepage. You can also include buttons in the footer to show verifications, applicable qualifications, or affiliated professional organizations. Take it a step further by making sure your website is secure and credible with SSL (secure sockets layer) security technology and https validation. Your homepage should highlight the philosophy that your company offers unique results, not just unique services. One of the most effective ways to demonstrate these unique results and build confidence in your company is through relevant reviews. Reviews and testimonials from past customers can convince viewers to believe in your brand. To maximize your reviews, consider presenting them in the form of a case study, where the testimonials tell a story. By giving context behind the review and mirroring a situation similar to the one viewers are in, you can create more validity for your company. Similarly including external links to sites like Yelp or Zillow can provide even more reliable reviews. Smaller companies should consider selling the experience of the owner, since the owner is often the brand and what makes the company so unique. 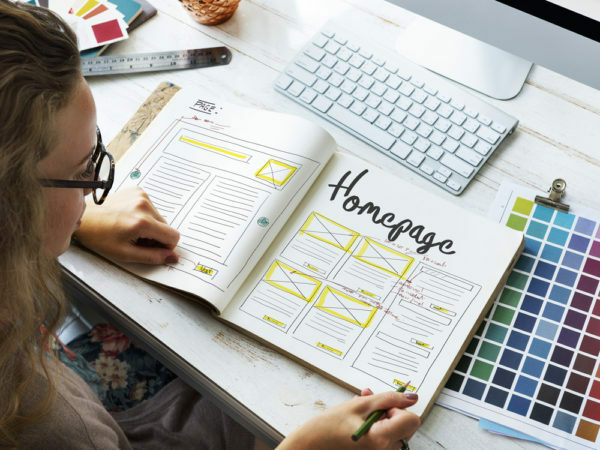 To provide content while still making the homepage visually appealing, consider including graphs or figures that showcase company success or scrolling testimonials along the bottom of the homepage. Effective call to actions produce real results. From convincing people to sign up for a free consultation to persuading people to give their contact information in exchange for a monthly newsletter, call to actions can show a clear benefit, ignite curiosity, or solve a problem. To develop an effective call to action, make sure it encompasses why your product or service matters and what sets you apart from your competitors. If you have multiple call to actions, make sure they are organized, so you don’t overwhelm viewers. Make your call to actions clear and make them pop! You proved why your company can be trusted, gave the viewer a clear indication of what their next step should be, and convinced them to move forward with your company. Now, it’s time for them to get in touch with you. Make sure your contact information is easily accessible on your homepage and throughout the website. This means including your phone number, address, and social media links in the header so potential customers can communicate with you no matter what page of your website they are on. Links to your social media profiles on platforms like Facebook, Twitter, Google Plus, Yelp, and Zillow are crucial to promoting involvement with other digital marketing channels and further building your credibility. More than half of today’s users are mobile based, so make sure all of your homepage design and content upgrades are mobile-friendly. Double check that the font size is readable, quotes are visually prominent, margins are adjusted, and hyperlinks are functioning. Maximize SEO tools for best results. Implement custom meta descriptions for each page to entice click-through and conversions. Use the Yoast SEO plugin tool on each page to optimize the title, URL, alt tags, keywords, and more. This handy tool analyzes your page for things like readability, keyword optimization, and content insights. Index your site with Googlebot more than once for your site to show up in the search results because search engines like Google don’t automatically update. Apply Google Analytics to your website to see all the data and insights behind your site. Write for humans first and search engines second. Although you want to rank for keywords, your primary focus should be attracting customers. That means no keyword stuffing! As mentioned in part one of this guide, you have three seconds to capture someone’s attention and convert them to a customer after landing on your homepage. That means if it takes five seconds for the homepage to load, you already lost a potential customer. Test the speed of your website with Google’s PageSpeed tool. Then, improve the speed of your website by optimizing images and limiting redirects. Don’t let a few seconds stand in the way of success! Cuselleration is here to help. At Cuselleration, we make website development simple and easy for our clients. From discussing your overall digital goals during our initial design consultation to training your staff on website administration after the site is launched, our web experts are with you every step of the way. Click here for an in depth description of our custom web design services.